Let Best Security simplify your life with Centurion's GSM G-ULTRA controllers! What could be more convenient? Imagine sitting on a beach in Margate and being able to open the gate for your garden services back home in Jozi. Imagine never having to worry about range because your cellphone becomes your gate’s remote control. Even at the office your life becomes easy beacuse you can control your business complex's gate with your cellphone, no need for distance-handicaped remotes! And why stop at gates? With Centurion’s range of GSM products, you can control up to two electrical devices via a missed call, SMS or Please Call Me from your mobile. You can activate or deactivate your alarm system, open your gate and be notified,switch your geyser on or off and even be notified of power failures. • Existing gate motors – open, close and intelligently monitor your gate status, all via your phone! Password protection means that no one else can control your G-ULTRA. Passwords can be changed as often as necessary so your security is never compromised, and only numbers that have been learned into the G-ULTRA are able to operate it. Effortlessly enable and disable your G-ULTRA devices, or suspend access numbers, for maximum security, either via SMS or using CENTURION’s secure and convenient G-WEB PLUS web interface. For even more security, flexibility and control, use the built-in Weekly and Visitor Access Modes to control access right down to the minute! (Weekly and Visitor) Set arrival and departure dates and times; guests will only be able to activate the device’s outputs between these limits, giving you maximum security and affording your guests maximum convenience. As a special value-add developed specifically with B & B owners in mind, customised arrival and departure messages with welcoming messages, access instructions, etc., can be sent automatically to guests and visitors. Alternatively set weekly recurring time-periods (for example 8am to 5pm, Monday to Friday) during which users will have access to the system. Outside of the configured time-periods, access will be denied. Add the ability to map inputs to outputs, customise the input and output notification messages and use the G-ULTRA in advanced applications, such as industrial fridge/freezer temperature monitoring, and you have a powerful and convenient GSM-based monitoring and control solution. Up to 20 separate text messages with up to five scheduled outputs can be configured. Time barring windows can be configured to block notifications, activations or specific access numbers. The G-ULTRA looks after your property when you’re not around. It can be configured to monitor up to four separate electrical devices, such as your home alarm or even a water reservoir. It could send you an SMS, give you a missed call or even send you an email, letting you know if your alarm is on or off or your reservoir is full or empty. When configured as inputs, the unit’s four individually-configurable channels can be configured to react to Rising Edges, Falling Edges, or both, which makes it ideal for monitoring variable levels such as mains power. A single input can be used, for example, to send a notification to users when mains power has failed, and the same input can notify users once it comes back on, freeing up the other inputs to take care of monitoring duties for other devices. With the G-ULTRA, your peace of mind is not dependent on physical proximity, and the rules of physics can be bent so that it’s almost like you’re two places at once. 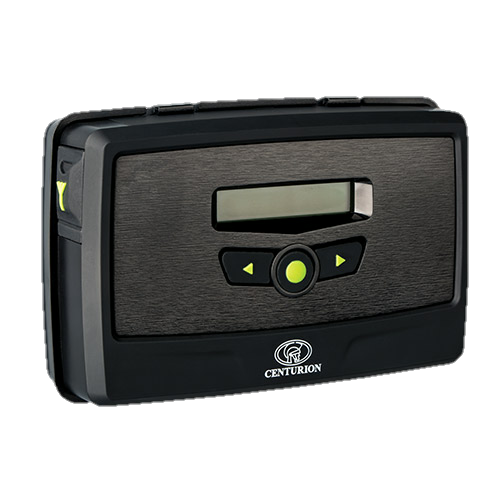 With seamless integration with CENTURION gate motors, your G-ULTRA will let you know when your gate has been left open, or is in any other state specified by you through intelligent monitoring of the gate motor’s status output. Adjustable Filter settings mean that you can specify under which conditions you are notified about a particular gate status, for example, if the gate has remained open for longer than 20 seconds. This smart device provides intelligent feedback via a graphic user interface displaying status, system information and diagnostic messages for the complete ULTRA experience. With the G-ULTRA’s Any Number Mode feature, you can temporarily allow access to anyone in possession of the module’s mobile number. This is a very convenient solution for parties, corporate functions and other soirees since you don’t have to manually add and delete hundreds of users – the G-ULTRA will be your bouncer! Then, after the event, simply disable All Pass Mode and return the unit to full, ironclad security. The G-ULTRA can remember and communicate with 1500 different users – making it perfect for either residential, commercial or even industrial applications. Further adding to this product’s incredible versatility as an access control and monitoring solution for virtually any application, we’ve increased its onboard memory to cater for access profiles, event logs and a host of other customisable features. The access number configuration profiles eliminates the hassle of configuring inputs and outputs and permissions every time that a new number is added. We’ve done the hard work for you! Control Forgot to switch on the alarm before you left home? Don’t turn the car around… Control your home – from your phone. Simply Missed Call (free) the G-ULTRA or send it an SMS, either from your mobile phone or from CENTURION’s secure web portal, G-WEB PLUS. Or, even better, just press a digit on your phone’s keypad to remotely activate the output. It’s like waving a magic wand! You can turn a seemingly endless list of electrical appliances and devices on and off just by using your phone and, using the Sticky Latch feature, latched outputs will ‘remember’ their states if power to the device is cycled ensuring that fickle power supplies will never leave you powerless. The G-ULTRA boasts four channels, individually configurable as either inputs for monitoring or outputs for control – and we’ve even thrown in an additional two relays to give you even more control at your fingertips. Forgot to switch on the alarm before you left home? Don’t turn the car around… Control your home – from your phone. Simply Missed Call (free) the G-ULTRA or send it an SMS, either from your mobile phone or from CENTURION’s secure web portal, G-WEB PLUS. Or, even better, just press a digit on your phone’s keypad to remotely activate the output. It’s like waving a magic wand! You can turn a seemingly endless list of electrical appliances and devices on and off just by using your phone and, using the Sticky Latch feature, latched outputs will ‘remember’ their states if power to the device is cycled ensuring that fickle power supplies will never leave you powerless. The G-ULTRA boasts four channels, individually configurable as either inputs for monitoring or outputs for control – and we’ve even thrown in an additional two relays to give you even more control at your fingertips. The only thing easier than using the G-ULTRA is administering it. Our intuitive G-WEB PLUS website lets you configure, monitor and receive reports online. G-WEB PLUS provides a great-looking, user-friendly and easy-to-navigate interface, enabling you to change multiple settings using a single synchronisation versus multiple SMS commands. The online portal helps you keep track of settings, access numbers and transaction logs and further expands the Ultra Universe with heaps of fantastic features developed to make your G-ULTRA really come alive. Avoid being left out in the cold with the G-ULTRA’s reliable battery monitoring facility. Your module will monitor its power source as closely as you monitor your daughter’s new boyfriend, and send you an SMS notification if the voltage falls too low as well as shutting down to conserve battery life and prevent the battery from being damaged. An internal GSM antenna ensures healthier, more reliable network signal strength without the frustration of trying to find the optimal location to mount the unit. If you need to fit the G-ULTRA in a metal enclosure, simply attach an external antenna to the onboard connector. G-WEB PLUS is a unique offering from Centurion Systems that allows you to set up and monitor your G-ULTRA devices via the Centurion Systems website. That means you don’t even have to waste precious time and petrol going to site – all G-ULTRA administration can be done from the comfort of your home or office! Whether you want your SMS input notification to say ‘Gate Activated’ or something more James Bond-sounding like ‘Perimeter breached’, you can easily customise the message alerts using the G-WEB PLUS interface. With the simple click of a mouse, you can configure the outputs to respond to either a missed call, SMS or your phone’s touchpad (DTMF), be pulsed or latching, and you can even set how many times a particular number is allowed to activate an output. Besides being an admin dream, G-WEB PLUS is also great for surveillance and site monitoring. Detailed transaction logs tell you exactly when your G-ULTRA devices were activated, and by whom. You don’t have to be a super sleuth with G-WEB PLUS keeping tabs for you! Thanks to the G-ULTRA’s over-the-air bootloading facility, you can update the device’s firmware from any PC or laptop with internet access, giving you time for life’s more important things! The G-ULTRA offers four channels which can be individually configured in any combination of inputs and outputs, plus an additional two relays which can be used to control electric devices.